Featured in Garden & Gun and Southern Accents magazines, Woodland Cottage was decorated by acclaimed designer Kathleen Rivers of Charleston, South Carolina, and designed by Jack Davis of Atlanta, Georgia. Blending into a forest of old-growth maple, hickory, oak, and evergreen trees, the beautiful property is pure serenity. The home was assembled from reclaimed nineteenth-century log buildings from Tennessee and Kentucky and sited on nearly an acre overlooking Chimney Top and Rock mountains. With its patina of over 150 years of weathering, the log home feels as if it was passed down through many generations. With all the sophisticated charm of a British hunting lodge, there are historic details everywhere you look, such as dovetail notches and hash marks created by the broadaxes of Appalachian pioneers. 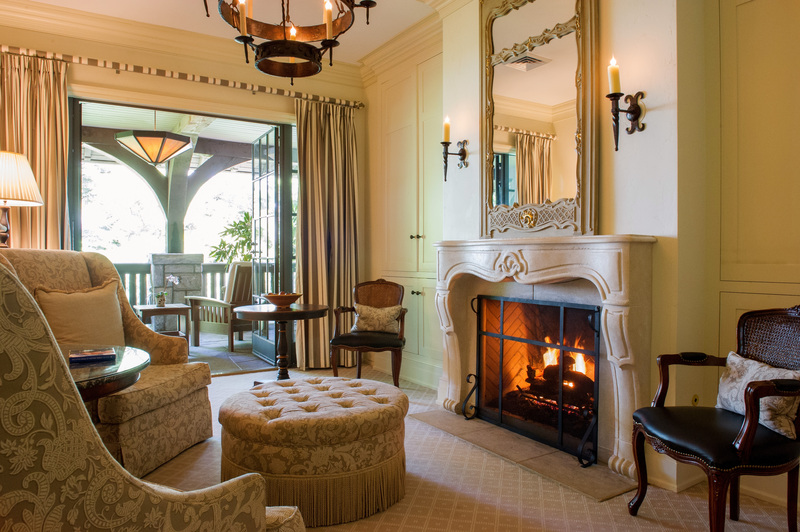 The sumptuous great hall offers 30-foot ceilings and an imposing fireplace crafted by third-generation stonemason Leland Huey. Reclaimed heart-pine floors are throughout the home and custom touches such as lighting fashioned from found objects and custom cast-concrete sinks in the master bath. The screened porch is the epitome of southern hospitality with a fieldstone fireplace and a porch swing perfect for reading the Sunday newspaper. Take an after-dinner stroll through the garden paths after an evening of entertaining and relaxation. Rarely does a property with such unique architecture and welcoming Appalachian aesthetic as this come on the market. When in the mountains, it’s easy to find yourself staring into the majestic vistas that surround you. 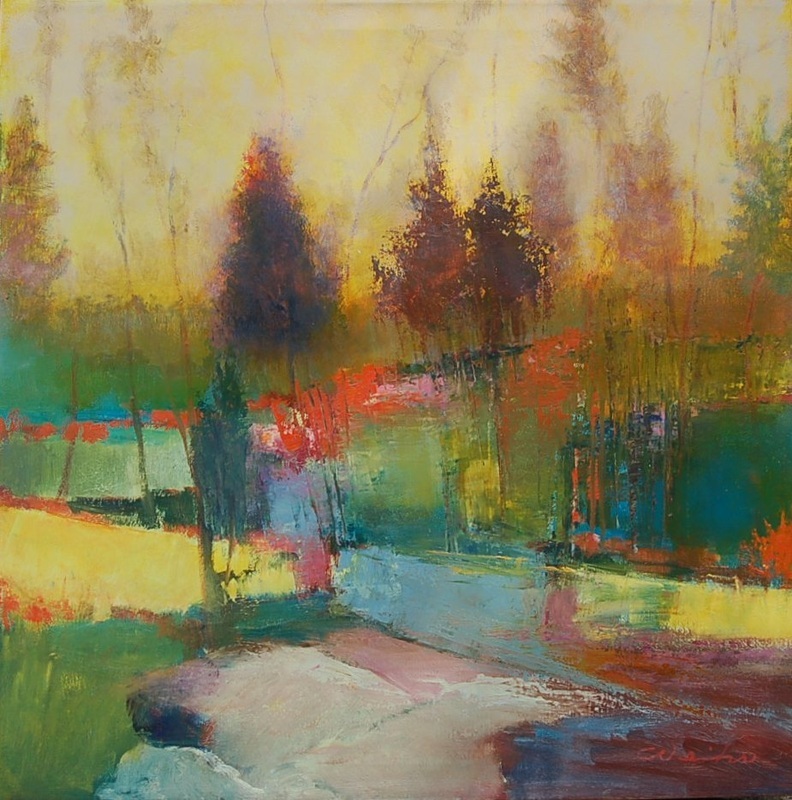 You will feel something similar when viewing the abstract, contemporary oil paintings of Karen Weihs. Picasso once said, “Art washes away from the soul the dust of everyday life.” For Karen, art is about creating imagery that allows the onlooker to formulate their own story, their own connection. Alluding to the familiar without giving the pieces away, she captures the essence of personal experience and reality to shape what the eyes see. In a magical blend of technique and tool, she paints a million stories of human experience on one canvas. Her skill is honed by palette knives and a selection of brushes that produce the glimmer of day by evening light. Weihs’ canvases are illuminated by intuition. Her mind may visualize a deer prancing deep within the forest while sun rays gently kiss the morning dew, yet it is the dance of her hand anticipating the next jab, carve, or smoothing technique that brings the deer to life. The impromptu maneuvers are the platform for the viewer to continue the journey of the story they see, perhaps recalling a past memory or looking toward a dream. Her works radiate from the inside out, without attachment, separating her visualization from the journey another will take at its sight. Masterpieces meant to inspire, encourage, stimulate, or spark something from within another, whether that be dew on the earth, floating clouds, sunlight, leaves swaying in the treetops, or the piercing blank stare of a deer. Karen and her husband moved to Cashiers from Charleston, South Carolina, where she was born and raised. Her private mountain home studio, Sunny Point Cottage, is both a working and teaching studio, offering half and full day retreats (private critiques and workshops) to encourage confidence and craft. The artist desires to help others find the best from within themselves, advising others to trust the process and their instincts. Where can you view the art of Karen Weihs? Centrally located, Sassafras Ridge offers easy access to the numerous amenities of both Cashiers and Sapphire. Consisting of 259 acres but only 30 homesites, this development’s privacy is unmatched with National Forest and private conservancy land surrounding the community. Enjoy panoramic views of Whiteside and Chimneytop Mountains from this spacious four bedroom, four and a half bath home in Hickory Ridge, a picturesque enclave located just minutes from town. Vaulted ceilings and skylights bring in lots of natural light to the open floor plan. The master suite, one guest room and an office are located on the main level. Two additional guest rooms are located on the lower level, along with an indoor pool with glass doors opening onto a stone patio. The covered decks expand the living area and let you enjoy cool summer breezes along with the amazing views. This is a great home for both year round and seasonal use, with plenty of room for family and friends. Many recent upgrades have been made including the installation of a generator. For those who live here year-round, breathtaking views of the Blue Ridge Mountains continue to astound, the scents of wildflowers and mountain laurel blended together on a cool mountain breeze continue to inspire, and the activities of a stroll through an ancient forest or the time-honored tradition of a day of fly fishing continue to delight. Since its inception, the Cashiers community has been based largely upon a foundation of Southern Hospitality in celebration of nature's splendor. You are welcome to enjoy an outdoor concert on the Village Green, explore the gift shops that line the streets of Cashiers' downtown area, or just sit back, relax and breathe in the unforgettable sights and sounds that surround you. On the market for the first time, this amazing property in Continental Cliffs is situated on eight-and-a-half acres of serene privacy that will make you feel like you’re in another world-yet you’re only three miles to the center of Cashiers. This is one of the most breathtaking and awe-inspiring views that can be seen anywhere. Perched at a cool elevation of just under 4,000 feet, you’ll feel as if you’re able to reach out and touch the famed Whiteside Mountain in one direction, and with just a tilt of your head, you can see all the way into South Carolina. The home offers one-level living with four bedrooms, an office, and another bonus room. Impeccably maintained, a master suite and a magnificent chef’s kitchen have recently been added and appointed with the latest cooking amenities. If expansion might be in your plans, there are a couple of near-level spots within the acreage to build a guest cottage. This property is for a seasonal or year-round resident who’s looking for a great home with privacy, jaw-dropping views, and great location between Cashiers and Highlands. A whole-house generator is already in place.